Sociopaths may look human like us. They have a body like us, they have faces like us, but they are not like us. I believe being human means to have the higher intelligence than that of a primal animal. Being human means to have a conscious, and feel empathy for our fellow man. Love is part of being human. Since sociopaths lack a conscience and are incapable of demonstrating and feeling real empathy or remorse, it is hard to classify them in the same category as us. Sociopaths are primitive, like wild animals and act on primitive survival skills like wild animals. Sociopaths seem to be more of like reptilian snakes than humans. We know snakes and wolves kill to survive. Wild animals such as lions kill to provide to food for their young and their families. The sociopath destroys others, not for the anyone but themselves. They do it out of pure hatred and spite. So it's seems like the sociopath is less evolved than a wild animal on an emotional basis. One thing we know the sociopath does is try to be like us. They try to convince us that they are caring, empathetic, and loving. When they are anything but caring, empathetic and loving. The sociopath needs to know how to appropriately act and what emotion to use, or we may see through them. So they have perfected their lying, and manipulation. These are these are their survival skills. Every life they have destroyed, they learn a little more about empathetic humans, and how to get what they want from them. They go through life using one person after the next. Destroying one life after another. And they never feel an ounce of remorse for it. They literally never feel any guilt or remorse. They rarely say sorry, but if they do they are not sorry because of what they did. They are sorry that they got caught for it. So we know sociopath’s look human, but I do not want to be in the same human classification as a sociopath. They do not possess enough emotional human qualities to be called human beings. Humans possess a light within. A soul. I am not sure if a sociopath has a soul. I believe they possess more a an entity within. Meaning when they die they do not go to the afterlife, they simply turn to dust. Souls live on forever. They sociopath does not. Sociopaths try to be like us because we are unique and absolutely fascinating to them, because we are so unlike them. Sociopaths do show emotion, in order to manipulate us into believing they are capable of having emotion. When first meeting a sociopath we are unsuspecting (unless we have been targeted by one before) The reason we are so attracted to the sociopath is because they are mimicking us, they are pretending to be like us. So we feel we have a connection with them, because we have so much in common. 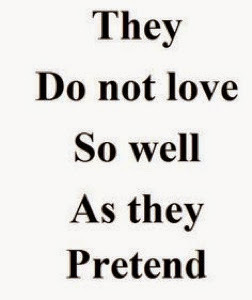 They pretend to be someone who has the same interest we do. Their biggest weapon is their magnetic charm. They can even kill and yet sympathy for it ! YES, IT IS TRUE, at least in my experience. Since they have no remorse or conscience, when they hurt others, they perhaps do not realize what they are doing. How will they ever stop? They are incorrigible and therefore very dangerous to society. They do understand but only at an intellectual level. They use that understanding beautifully to tell their victim and spectators how sorry they are for their acts....and THEN callously go ahead and HURT them anyway - leaving the victim confused and frustrated. "How can my sociopath partner hurt me so much when he is so kind and apologetic. Poor him." The victim realizes the true colors of the sociapath when the harm done by them becomes humanly impossible to bear. 2) The emotional abuse and pain that they inflict is not visible to others. My spouse was smart enough not to cause any overt physical damage. In fact there was a conscience image built in public of being a perfect gentleman. 3) They give what people want - psychologically, financially, emotionally thus totally controlling them. I simply cannot fathom how my spouse manages to command such willing servility from people around him that they lose all reason and simply and blindly follow him. Such is the co-dependency of people around him. Incredible! But now, I am out of a relationship with a sociopath. I am beginning to smile and feel positive and secure in my life for the FIRST TIME. I cannot thank God enough. Yes they are smooth talkers... Very magnetic personality. Until the real them shows up. Then you see the monster they are.